More than 225 guests attended the annual Graves-Chapple Research Center field day on Tuesday, Aug. 22 at the Center near Rock Port, Mo. The tour wagons were packed throughout the morning during the annual Graves-Chapple Research Center field day on Tuesday, Aug. 22. 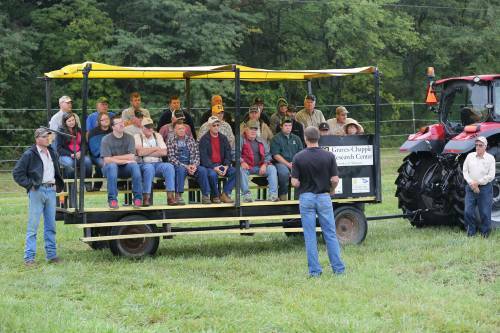 More than 225 guests enjoyed presentations on a variety of agricultural-related topics. There was a special question and answer session on dicamba during the event as well. The field day focused on several important agriculture topics, such as dicamba, nitrogen application timing and rates and improved soil health. Kevin Bradley, a University of Missouri Extension weed specialist, led the question and answer session. Bradley was a part of the dicamba tour, which also featured discussions by Andy Luke, MU Extension agronomy specialist, and Ray Massey, an MU Extension professor. More than half of the crowd stuck around to ask questions to Bradley, who was able to dive deeper into the dicamba issue. “The question and answer session is something we’ve never done before,” Crawford said. “Dicamba is a hot topic, and we knew that on a 15-minute tour stop Kevin could spend that entire time just answering questions. We used his tour as a way to get the information out to everyone. They could then bring their questions to him in an open forum. Attendees also learned about crop and pest management during the field day. The crop management tour focused on nitrogen application timing and rates, improved soil health and cash rental rates. The pest management tour touched on subjects such as corn and soybean insect issues, marestail and corn streaks, spots, blights, blotch and rust. Christopher Daubert, MU College of Agriculture, Food and Natural Resources vice chancellor and dean, addressed the crowd during the free lunch. Daubert began his duties at CAFNR on Aug. 1. Marshall Stewart, MU vice chancellor of extension and engagement, and Mark McIntosh, vice chancellor for research, graduate studies and economic development, also made the trip to the field day. For a closer look at the Graves-Chapple Research Center field day, visit: https://www.flickr.com/photos/cafnr/albums/72157688029279065.